Located in an unspoiled rural area, NIESA riding center is just 20 minutes drive away from Sofia on Trakia highway at the exit for the town of ihtiman. The modern facilities are purpose built for riding and horse breeding. The 65x30m indoor arena and the 70x45m outdoor arena are perfect for year round riding. We also benefit from the best hacking opportunities with instant access to the fields and mountains of Sredna Gora and Rila. The stables offer 40 large boxes and 40 decares of pastures. A cosy club-restaurant viewing the indoor and outdoor arenas and summer terraces, convenient dressing rooms and bathrooms are just a part of the facilities for customers. 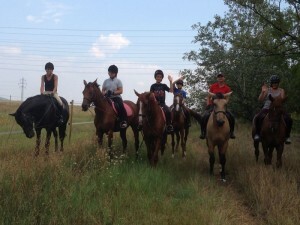 The most important, though, is the team of licensed trainers, devoted to their profession, who are providing lessons for adults and children of all abilities and ages – starting with novices and ending up with those willing to master the horse sport and take part in competitions or just take a ride in the open on the back of their horse. Monday to Sunday from 9 am to 7 pm, Wednesday – until 9 pm. Booking in advance is required for Wednesday evening and hacking, as well as for an English speaking instructor. 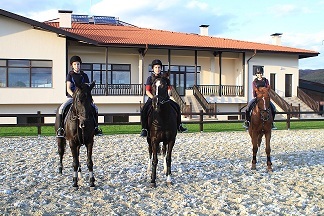 The newly built riding center has been in operation since 2012 under the management of Stoica Argilashki, a certified trainer and judge in horse riding who has extensive experience in training children, amateurs and competition riders. As a competition rider and trainer, Stoica began his career in 1968 in the city of Saedinenie – an area with century-old tradition in breeding horses and professional development of riding as a sport. Throughout the years, competition riders trained by Stoitsa are part of the national teams in cross country, show jumping and dressage. Liuba Argilashka(Buba), a leading professional in horse riding sport in Bulgaria, is part of the team. She has horses in her blood, and has been riding since the age of 6. She began her career in jumping and has competed in Germany, Turkey, Portugal, Greece, Holland, and of course Bulgaria. Buba has a qualification as an International Instructor and Judge from the International Equestrian Federation. Rayko Ganukov is a certified instructor in riding with 25 years of professional experience as a competitor. He is on the top list of the best Bulgarian riders in Dressage and part of the National Team in Dressage. He has a proven record of success in national and international competitions. In 2015 Raiko won the first place in the Balkan Dressage Championship. Marian Ruzhinov is born in the town of Ihtiman and has been close to the horses since his childhood. He gained professional knowledge in horsemanship after joining the team of the horse riding center where he practices his job as instructor for the last 10 years.